The FOH position at Bridgeway Community Church in Columbia, Maryland. Bridgeway has been relying on GC Pro for its wireless systems and related products. WESTLAKE VILLAGE, CA, September 4, 2012 — The “White Space” issue has changed the way the wireless world works. As a result of the transition to digital broadcasting over the last three years, the region of the RF spectrum where wireless microphones have worked – mostly between the 700 MHz to 800 MHz range (aka the “White Spaces” between analog channels) is no longer available. That’s meant that wireless microphone users have had to replace their systems with new ones that comply with the newly constricted spectra available to them, beginning at 470 MHz up to about 698 MHz, and a small band above 900 MHz. House-of-worship users have been particularly affected, as many churches today rely on wireless audio for everything from worship services to theatrical and music performances. That was the case at the Bridgeway Community Church in Columbia, Maryland, a nondenominational, multicultural house of worship that puts an emphasis on dramatic presentations and music concerts and uses up to 24 channels of wireless for them. So when the new regulations governing the RF spectrum came into being, the church turned to their long-time collaborator for keeping its AV systems working at peak performance: Guitar Center Professional (GC Pro), the outside sales division of Guitar Center that focuses on the needs of professional users. Working with Mitchell Shaivitz, Account Manager at the GC Pro Baltimore area office, the church’s Technical Director Derwent “D” Williamson was able to source all of the wireless systems and products he needed to keep the church’s productions at the cutting edge of technology and regulation. In the past, says Williamson, the church has had problems with dropouts, and the arrival of new regulations regarding wireless spectrum allocation meant it was time for an upgrade across the board. Working through GC Pro, the church purchased 14 channels of new Shure ULX-D wireless, including handheld transmitter and bodypacks, plus Shure PSM900 in-ear system and a Shure PA821A 8-channel antenna combiner. 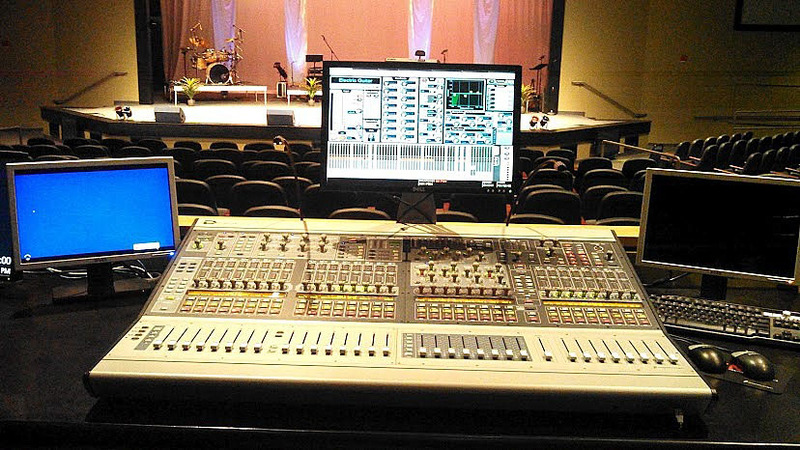 Photo Caption: The FOH position at Bridgeway Community Church in Columbia, Maryland. Bridgeway has been relying on GC Pro for its wireless systems and related products. Guitar Center is the leading United States retailer of guitars, amplifiers, percussion, keyboards and pro-audio and recording equipment. Our retail store subsidiary operates 234 Guitar Center stores across the United States. In addition, our Music & Arts division operates 101 retail stores specializing in band and orchestra instruments for sale and rental, serving teachers, band directors, college professors and students. We also are the largest direct response retailer of musical instruments and related products in the United States through our wholly owned subsidiary; Musician’s Friend, Inc., and its catalogs and owned or operated websites. More information on Guitar Center can be found by visiting the Company’s website at www.guitarcenter.com.